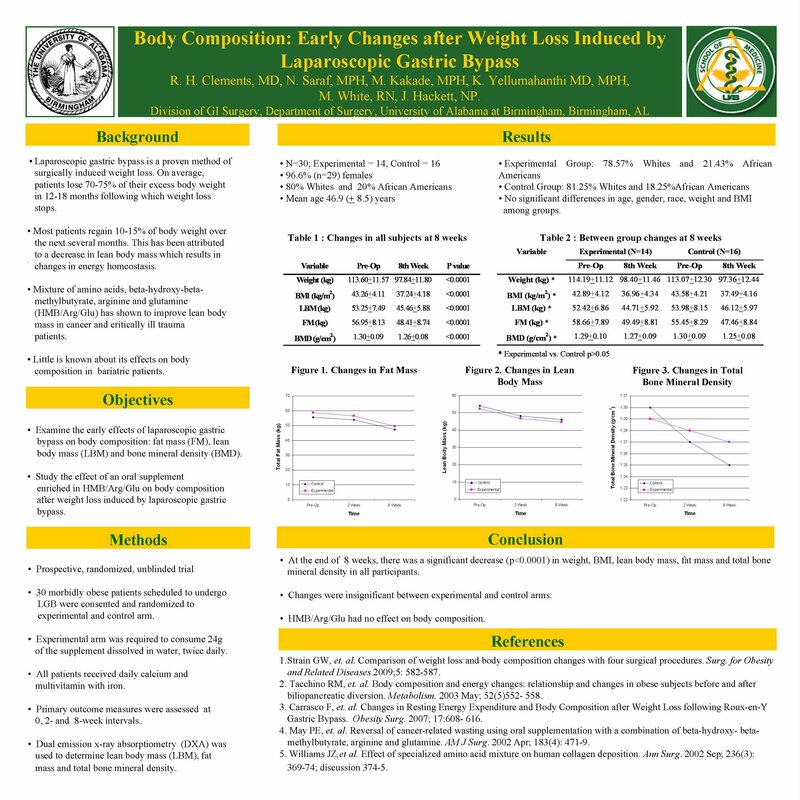 Body Composition: Early Changes After Weight Loss Induced By Laparoscopic Gastric Bypass. Objective– To examine the early effects of an oral supplement enriched in beta-hydroxy-beta-methylbutyrate, arginine and glutamine on body composition after weight loss induced by laparoscopic gastric bypass (LGB). There have been several studies demonstrating the late effects of LGB on lean body mass (LBM), fat mass (FM) and bone mineral density (BMD) after LGB but little is known about the early changes in these components. Method– Patients scheduled to undergo LGB were consented and randomized to experimental and control group. The experimental group was required to consume 24g of supplement dissolved in water, twice daily and record their consumption. All patients received daily oral supplementation of 1200 mg calcium and vitamin D. Primary outcome measures of interest namely; weight loss and body composition were evaluated at 0, 2 and 8 week intervals. Dual emission x-ray absorptiometry (DXA) was used to determine LBM, FM and BMD. Results– 27 morbidly obese patients with mean age 46 + 8.5 years (78% Whites, 22% African Americans, 96% females) and mean BMI 43.2 +4.1 kg/m2 were enrolled. Paired t test was used to compare means in all (N=27) subjects at 8 weeks. The results are represented in the tables below. Independent t test was used to compare the means between the experimental (N=12) and control (N=15) groups and the results are depcited in the table below. Conclusion– At 8 weeks, there was a significant decrease in weight, BMI, FM, LBM and total BMD in all subjects. The changes compared between Juven™ and control groups were found to be insignificant.